So, after our interruptions at Midway, and offering countless apologies about the behaviour of the British Army 250 years ago (I think they might struggle to repeat that now), we were too late to make our objective that night, Saturday 4th. 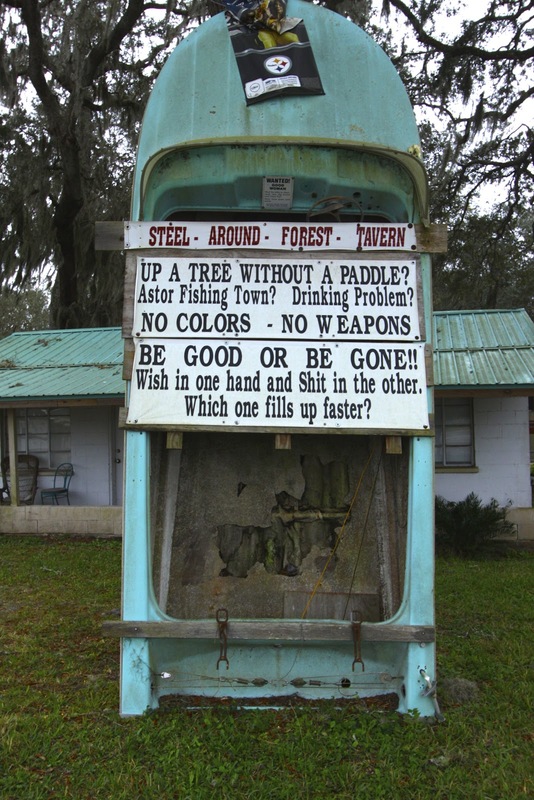 Instead, perhaps predictably, we pulled into a KOA for the night, in Starke FL. Not much to say really…. it was a KOA. The next day we got going reasonably early and headed on out into the boondocks of Florida swamps. Actually, we didn't so much head out, as get lost. Twice. 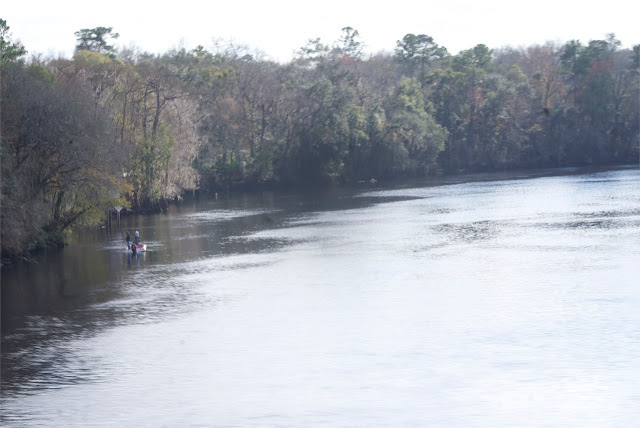 Once, we went 60 miles the wrong way, and ended up at the mouth of the Suwannee River - a so-called 'wild black-water river'. Alligator country. Anyway, we were lost, and finally I had to admit defeat and ask a local store for help to get us back on track. I have to plead extenuating circumstances for this exceptionally rare event (asking for help); the cable to the sat-nav is broken, so the stupid thing doesn't charge properly and subsequently turns itself off at the most inconvenient times, and secondly - my back-up was Sarah's navigation. "So. We're back on track now." I try to kick the conversation off without too much controversy. "Yes. Is that a rhetorical question, a genuine question or a statement?" "Err. Hang on. Trick question. I can spot that. I'll go for…. rhetorical?" "So. What happened back there then?" I ask more directly, rather bravely. "What do you mean? What happened?" "Well, you know, the little-bit-lost stuff." I see her stiffen. "Well, not really lost lost, so much, as slightly off course lost, right? I mean, you still knew we were in Florida?" Damn it. That wasn't meant to be sarcastic. "No… really, I just mean… well, what happened? How did you not know we were lost for 60 miles?" "Well, obviously you're blaming me for getting us lost, when you're driving. And the sat-nav was broken." "I'm not trying to blame you…"
"Good. I did my best." "I believe you, really I do, I'm just curious, because usually you're so much better." "The map's too small, and I can't see the lines or names." "Right. I see. So why didn't you say you didn't know the way?" "I did know the way, I just couldn't see it. Can we leave it now?" 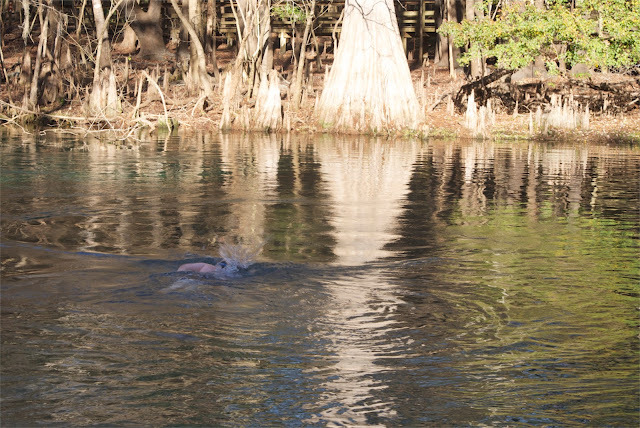 We ended up in Manatee Springs State Park, which was another wonderful accident. Almost as soon as we docked, we went down to the spring pool, and I went for a wonderful swim…. 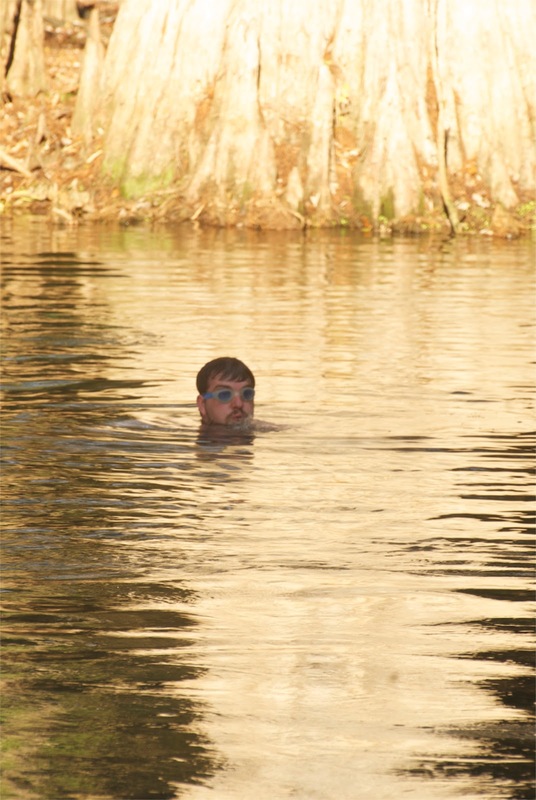 just to say that I have swum in an alligator swamp!! Didn't see any alligators though, nor manatees which were there somewhere due to the cold weather. Great place, would love to go back. You see that rope, with the buoys? 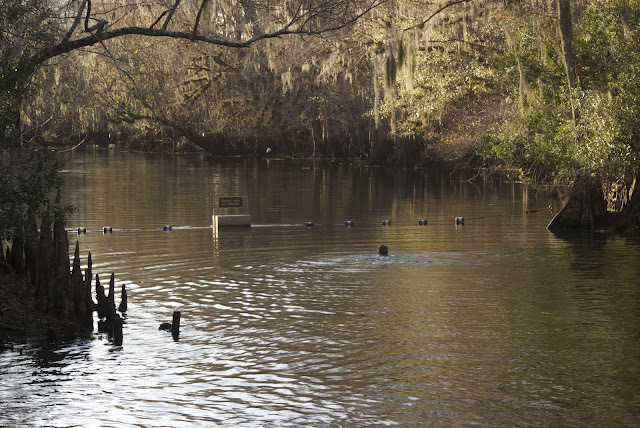 Presumably suspending a net to keep the alligators out of the swimming area? Err... when I swam over there and looked beneath -- guess what? No net. Gators are everywhere - golf courses, house pools and ...... ordinary pools with bouys!! Another "Great Escape" I think. Loved the beautiful houses in French colonial style. Very opulent.